Policemen stand guard at a courthouse after an attack by suicide bombers in Charsadda, Pakistan, Feb. 21, 2017. 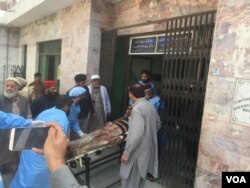 A suicide gun-and-bomb attack on a courthouse in northwestern Pakistan Tuesday killed at least seven people and wounded 30 others. 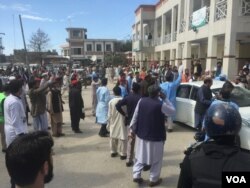 Police and witnesses said three gunmen wearing suicide vests stormed the courthouse in the town of Charsadda and lobbed hand grenades to try to enter the main building. District police chief Sohail Khalid told reporters security guards swiftly challenged the assailants, prompting two of them to detonate their vests during the gunfight while the third attacker was gunned down. A lawyer, policemen and civilians were among the dead, police and hospital officials said. A spokesman for Jamaat-ul Ahrar, a breakaway faction of the Pakistani Taliban militant group, claimed responsibility for the attack. A fresh wave of terrorist attacks is gripping Pakistan and Jammat-ul Ahrar, or JuA, as well as the mainstream Pakistani Taliban have taken credit for being behind most of the violence. The surge in militant attacks has left more than 120 people dead and hundreds of others wounded within the last two weeks. Local affiliates of Islamic State, however, have claimed Thursday’s suicide bombing of a famous Sufi shrine in southern Sindh province. The blast killed at least 90 devotees and wounded more than 300 others. Pakistani security forces have since responded to the spike in violence by unleashing a nationwide crackdown on suspected militants across the country, killing more than 100 and detaining 1300 others. Pakistan has also closed border crossings with Afghanistan and enhanced troop presence there, saying Jamaat-ul Ahrar and other anti-state groups have masterminded the violence from their bases in the neighboring country. The Afghan government has denied the charges. Why Isn't Afghan Taliban on US List of Foreign Terror Groups?